When the air gets crisp and the leaves start to turn colors, we all crave specialty fall flavors like the tartness of an apple or the sweetness of pumpkin. To make the most of these fall flavors try purchasing an amazing apple pie crafted from Connecticut’s locally grown apples. Whether you’re looking for a weeknight indulgence or a holiday dessert, these bakeries offer the best apple pies available in the Nutmeg State. Only open seasonally, come to Clyde’s as much for the historical experience as for the food and beverages. Clyde’s is the oldest steam powered cider mill in the U.S., and on weekends during your visit, you can see it in action pressing apples into cider. From the on-site store, you can purchase delicious apple pies, cider, hard cider, jam, and amazing apple cider doughnuts. This is definitely a go-to source for anything apple in New England. Celebrating 25 years in business, the American Pie Company is beloved for their made from scratch pies. The American Pie Company offers a huge range of pies including several renditions of apple pies. Daily, you might find apple crumb pie or a harvest fruit pie filled with apples, cherries, raspberries, and blueberries. Their specialty is filling orders for holiday meals complete with apple pie for dessert. 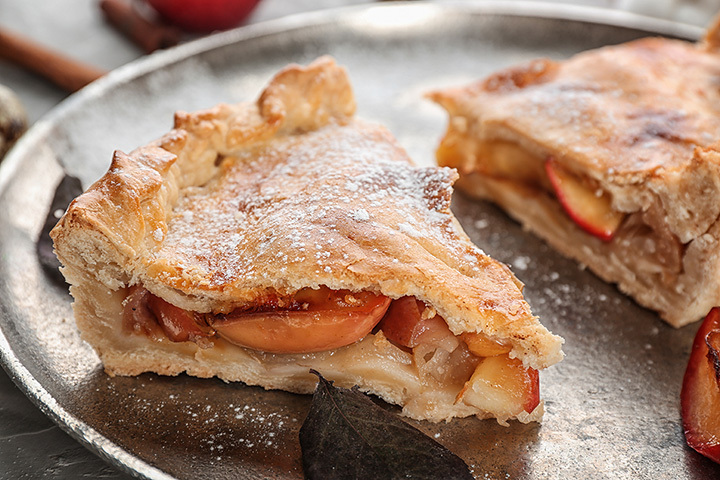 Why not go straight to the source when seeking out the best apple pie? Lyman Orchards, a massive pick-your-own fruit and vegetable farm located in central Connecticut, offers a variety of fruit products available for purchase both on-site and online. For your choice of amazing apple pies, they offer a hi-top apple pie, apple crumb, and an apple caramel walnut pie. To enjoy a combination of sweet flavors, opt for the Hi-Top Red, White & Blue pie, which is filled with apples, blueberries, and cherries. If you follow Granny’s Pie Factory on social media, you’ll see their #PieLife used frequently while sharing photos of their mouthwatering pies. Open since 2006, Granny’s seeks to connect families and friends through sharing a pie. On their menu, you’ll find more than a dozen types of pie including several apple pie varieties. For something sweet that tastes of summer, indulge in the apple peach, or for a more traditional fall flavor, opt for the apple cranberry. Whatever you choose, though, you’ll certainly enjoy the treat. Sono Baking Co. is a popular bakery and café that serves a variety of tasty treats such as apple turnovers, croissants, and sticky buns. One of their most popular options is their selection of pies, of which they make seven types. For those looking to eat all apple all the time during the fall, they offer an apple pie and an apple crumb pie. Whether you’re visiting at Oronoque Farms or at one of the farmers’ markets they frequent, their pies are definitely worth the trip. Oronoque Farms crafts more than a dozen different types of pies including additional seasonal pies as well as sugar-free pies. Be sure to order their award-winning apple crumb pie or bite into their crisp apple pie. The owner of Michele’s Pies is an award-winning baker with several published cookbooks to boot, so tasting pies from Michele’s Pies is definitely a delight. On the menu, you’ll find seven different types of apple pies including apple caramel crumb, apple raspberry, and apple cranberry crumb. For your convenience, you can pick up pies in-store or order them online. While a grocery store bakery might not spring to mind when thinking about where to find the best apple pies in the state, the bakery in McQuade’s Marketplace should not be overlooked. This bakery is equally as good as a stand-alone specialty bakery and its convenience can’t be beat. So, while picking up ingredients for your evening meal, swing by the bakery section at McQuade’s to purchase one of their excellent apple pies. Available for purchase at area farmers’ markets, such as the weekly Stonington Village Farmers’ Market, the pies crafted by Summer Hill Catering are worth seeking out. The pies from Summer Hill Catering are a very special treat to take home from an area farmers’ market, allowing you to taste the seasonal bounty. Their apple pies, apple caramel pies, and apple streusel are especially delicious. Pies can also be ordered for holiday meals if you don’t feel like baking your own. Whether you’re looking to purchase a breakfast sandwich while on the go, a loaf of freshly made artisanal bread to use at home, or a pie for a dinner party, Scratch Baking has you covered. If you’re seeking a seasonal pie, order one of Scratch Baking’s delicious apple pies or opt for one of their chilled apple galettes to go.